Following the opening of the new Kroger in the St. Lawrence Corner business district, the Price Hill Will organization has doubled its efforts to improve the neighborhood's business district. 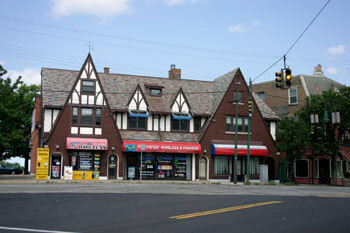 Late last year, Price Hill Will launched a facade improvement program meant to clean up the appearance of the district. This coming fall the City of Cincinnati will invest $800,000 for streetscape improvements with nearly 40 percent of those funds coming from the American Recovery and Reinvestment Act. The work is meant to match the streetscaping completed at the newly expanded and upgraded Kroger grocery store. “St. Lawrence Corner is a walkable district with tremendous potential for small business owners,” says Vakharia who highlights the fact that the small store footprints and lower price points offer attractive spaces for local and first-time business owners. The St. Lawrence Corner business district is a key area for Price Hill Will as it offers the opportunity to build off of the momentum the Kroger and new streetscaping projects have put in motion. The district is also near Price Hill Will’s Buy, Improve, Sell Program area that rehabilitates existing single-family homes and then sells them to owner occupants with a requirement of living there for three years. Price Hill Will has also collected data through the Local Initiatives Support Corporation (LISC) which identified that small dine-in restaurants are severely lacking with nearly $19 million in unmet demand for restaurants. This unmet need drives residents to nearby neighborhoods. The district boast 15,000 to 30,000 in daily vehicle traffic. “We need to make it a place where people feel comfortable walking and strolling about,” says Vakharia who says that there is also interest in developing some sort of a public space for the district. One potential location is a common area behind several of businesses that could host a connecting pathway between patio spaces - an ideal space for a community movie night. Another goal is to continue to reach out to the Spanish-speaking businesses in the area. A Guatemalan grocery store recently opened in addition to the several other businesses in the area. Price Hill Will says that they are working on a marketing plan and hope to ramp up recruitment efforts of new businesses to help fill the handful of vacant storefronts that currently exist. Vakharia is upbeat about the future as she believes it is a great area and that Price Hill Will can really make a big impact there.